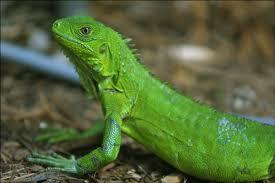 Green iguanas are 6.5 feet tall, weighing 10-15 lbs. Some species of Iguana grow very quickly. They can be five times longer and a hundred times heavier in just for twenty-four months. Average life span in the wild is 20 years; it is much shorter in captivity since many owners do not have the appropriate knowledge to take care of iguanas. Iguanas can stay under water for 28 minutes. Green iguanas are strict vegetarians. They do not eat, nor should they be fed, any animal protein. Some wild species do eat insects, however. Rhubarb is poisonous to iguanas. Iguanas love a variety of fruits and greens, including squash, strawberries, melons, green beans, peppers and watercress. Iguanas are the largest in the lizard family. They laying eggs and are cold-blooded like many other reptiles. Iguanas can drop 40 feet from a tree onto solid ground without getting hurt. Airplanes in America collide with an average of 1 iguana every 2 years on runways (according to federal records). Adult male iguanas can become very aggressive during breeding season. Breeding season lasts about three months. Female iguanas usually produce eggs, even if there is not a male around. Iguanas need to be handled every day to keep tame. If an iguana’s tail is cut off, they can grow another one. Because of their tail’s weak vertebrae, often iguanas break their tail to escape after getting caught. The tail makes up at least half the body length of an iguana.